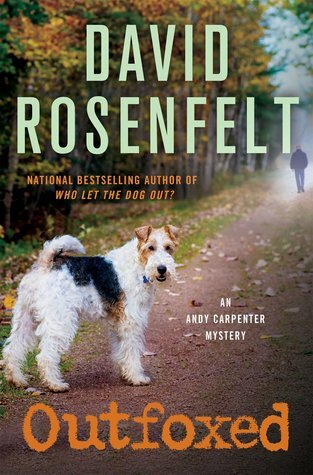 From Goodreads ~ Defense lawyer Andy Carpenter spends as much time as he can working on his true passion, the Tara Foundation, the dog rescue organization he runs. Lately, Andy has been especially involved in a county prison program where inmates help train dogs the Tara Foundation has rescued to make them more adoptable, benefiting both the dogs and the prisoners. One of the prisoners Andy has been working with is Brian Atkins, who has 18 months left on a 5-year term for fraud. Brian has been helping to train Boomer, an adorable fox terrier the Tara Foundation rescued from a neglectful owner. Brian and Boomer are clearly a terrific match. In fact, Andy hopes that Brian will adopt Boomer himself, once his sentence is up. Andy is a defense lawyer who doesn't want any clients. Because of the millions his father left him, he is able to not work and spend his time with his friend, Willie, running the Tara Foundation, a dog rescue that he and Willie formed. Andy had inherited a client from another lawyer, which was an easy case. Brian had been convicted of embezzling money from the computer company he and his friend, Gerald, started and is now in prison. He is coming up for parole in a couple months. Brian is part of a program that Andy has started with prisoners training rescue dogs. Then Brian escapes unexpectedly from prison and the next day is accused of killing his estranged wife and Gerald. Andy now had to defend Brian and prove that he isn't a murderer. This is the fourteenth book I've read by this author and I enjoyed it. I liked the writing style as it was funny, sarcastic and amusing. It was written in first person perspective in Andy's voice but at times it was also written in third person perspective when the focus is elsewhere. It is the fourteenth in the Andy Carpenter series (I've read them all) and it works as a stand alone (so you don't need to have read the ones before it to know what is going on). I like Andy. He loves his dog, Tara, and thinks she's the most wonderful dog in the whole wide world. Andy is married to Laurie and they recently adopted a eight-year-old named Ricky. Part of Andy's team is Hike, his associate who is the most depressed and downer person ever. Marcus, an investigator with persuasive reasoning skills, continues to provide protection when it's most needed (which is often since Andy is a self-professed coward). Sam is his accountant who is also a computer hack.